This week's Sunday Night Suds looks at 20 Pounds of Pumpkin. 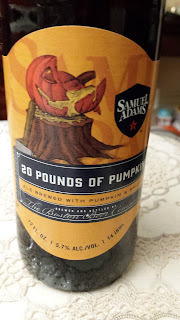 The 20 Pounds of Pumpkin is a pumpkin ale, but unlike many other pumpkin ales it does not have an overpowering pumpkin flavor and the spices added to the brew process (cinnamon, nutmeg and ginger) are also quite muted. This not to say that the beer is weak or watered down. It truly is an Ale and it has more hop backbone than one would normally find in a pumpkin ale. It does have some pumpkin flavor, but the flavor is subdued and does not scream pumpkin. I could see pairing this with apricot chicken or other poultry dishes. The Samuel Adams 20 Pounds of Pumpkin is under the Kosher Supervision of the Star-K and has a Star-K certification mark on the bottle. To see what the experts on Beer Advocate think about this brew, please follow this link - beeradvocate.com/beer/profile/35/229621.